Here it is. Labor Day Weekend. Serving as summer’s sweet send off, and typically wrapped up start to finish in backyard barbecues, Labor Day marks the transition from the dog days of summer to the revved up renaissance of all things fall. For many it also marks a seasonal switch in wine preferences and pairings. A subtle shift from light, bright and brimming with fruit towards wines that carry a bit more heft, solitude, and potential for pairing with heartier fare. However, to squeeze out the last drops of summer and offer the seasons best wine finds, we’ve rounded up some top notch wine picks to bring out the best in grilled grub. Farm fresh and bursting with brats, beef, poultry and pork, end-of-summer grills are looking for wines that deliver pairing versatility, fresh flavor and tend to be fruit driven. From ripe reds to the lively profiles of regional whites, and wrapping things up with a well-chilled rush of rosé, there are plenty of wine options that will suit all sorts of flame-broiled fare. Red wines are typically top picks for serving with a wide variety of heavy meat medleys; however, in the heat of summer, elevated alcohol levels can become more pronounced, masking much of the fruit character. The remedy? A quick 5-10 minute chill in the frig will revive flavors and amplify the wine’s innate fresh factor, while toning down overactive alcohol and giving reds their best bet to shine with smoky meat themes. 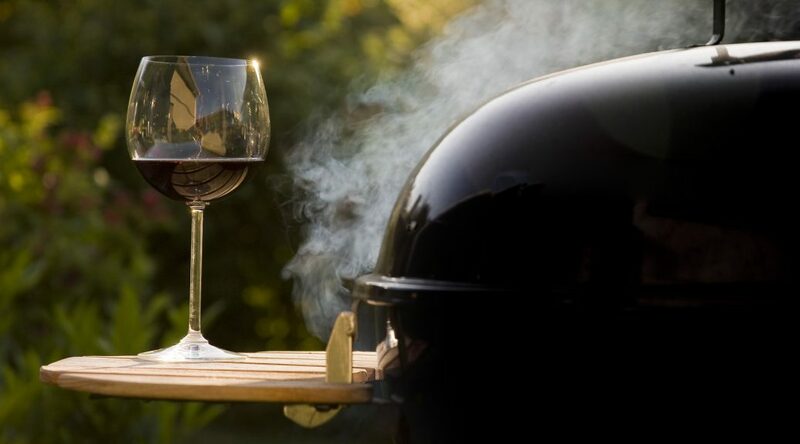 Zinfandel – The experienced griller’s go-to red wine. Handling smoked meats with forward, full throttle fruit, intrinsic black pepper spice and a generous, food-friendly nature, Zinfandel deserves a special spot next to the tongs and skewers. From pork chops to brisket and bison sausage to marinated and grilled chicken, or basic brats, hotdogs and burgers, the bold adaptable flavors of Zinfandel handles itself well with savory spice, but promises to shine particularly bright with a sweeter-styled barbecue sauce like the Kansas-City classic over ribs, brisket and pork. Syrah / Shiraz – It’s the same grape, but from very different places. Often flying with forward jammy fruit from the Land Down Under, Shiraz claims serious fame as Australia’s signature grape. When cultivated in the Rhone Valley of southern France, Syrah tends to take on more spicy character. Either way, this grape typically runs steady with black fruit character, offering a full-bodied wine with moderate levels of acidity, fairly tame tannins and rich velvety textures. The wine’s heady mix of smoke and spice give it a leg up for partnering with gamier meats like lamb, venison or elk. Tempranillo – Spain’s red wine wonder, delivering loads of blackberry, black cherry and blueberry fruit in tandem with earth-driven, tobacco-induced flavor profiles, Tempranillo typically carries an appealing, integrated tannin structure often toned down by age and moderate acidity. This particular grape’s style and versatile nature partner up remarkably well with grilled options that lean intentionally towards pork themes. Easy pairing options include braised pork ribs, the sweet, tender textures of pulled pork, or the succulent, juicy bite of barbecued pork chops. Sauvignon Blanc – While Sauvignon Blanc styles vary from region to region, most carry an unmistakable “fresh factor.” The vibrant acidity, citrus flavors and often herbal undertones, make regional Sauvignon Blanc a must-try wine for a variety of grilled veggie and herb-marinated chicken choices. Cooler climates tend to build a Sauvignon Blanc with more lemon-lime citrus character and “fresh cut grass” aromatics, while warmer growing zones plunge into plush, exotic flavor profiles with melon, grapefruit, pineapple and peach making a noticeable palate debut. Exceptional for grilled seafood, salad sides, and goat cheese themes, food-savvy Sauvignon Blanc is an easy and accommodating white wine option for covering all kinds of backyard barbecue dishes. Rosé Wines –Built on the sturdy backs of red wine grapes, and encouraging the delicious ripe, red fruit flavors from classic reds sans the tight tannins and higher alcohol levels, rose wines are the perfect pick for tricky menu combinations. Whether it’s heavy marinades, sticky sweet sauces or hard to please palates, rosé wines deliver remarkable versatility and palate appeal. Always served well-chilled, these are red wines in their summer suits, ready to refresh and cleanse the palate with vibrant acidity and an exceptionally food-friendly nature. Reach for rosé when grilling salmon, chicken or burgers and don’t shy away from sparkling rosés, which marry the best of bubbles with a dry-style and fresh red fruit flavors.